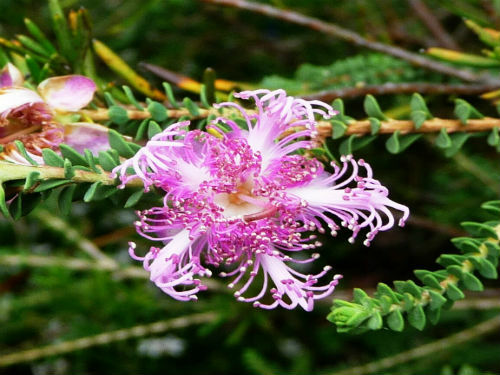 Melaleuca pulchella, Claw Honey-myrtle is a small shrub with a spread of 1.5 metres. The branches are pendulous and spill onto the ground. Small leaves are light green and oval to oblong in shape. Mauve flowers are carried in clusters with their staminal bundles curling inwards similar in appearance to a claw (hence the common name). Individual flowers are said to be the largest in the genus. Spring to early summer is the flowering period. Claw Honey-myrtle has proved to be hardy and free flowering. M. pulchella would be at home in cottage gardens, rockeries or as a foreground plant in garden beds. The Claw Honey-myrtle is found on the south coast of Western Australia. The species name means beautiful and of course refers to the flowers.